Popcorn is a whole grain, an essential food group many Americans lack. Whole grains offer valuable amounts of fiber and nutrients, such as B vitamins and iron. Just because popcorn is nutritious, however, does not mean it suits every person's diet. Pain that follows popcorn eating might stem from a variety of factors. Gaining understanding of these factors might help guide you toward making wise dietary and lifestyle decisions. If you have a condition that affects your digestive tract, eating popcorn might stimulate abdominal pain and other symptoms. If you have diverticulitis, for example, a condition in which tiny pouches in your colon become inflamed, some physicians suggest avoiding coarse foods such as popcorn out of fear that particles might lodge in the pockets, triggering or worsening pain. Because popcorn is a rich source of fiber, which promotes digestive activity, it might worsen stomach pain and diarrhea associated with colitis, Crohn's disease and irritable bowel syndrome. Abdominal pain is a common symptom of gas in your digestive tract and is a normal part of human health, according to the National Digestive Diseases Information Clearinghouse. While digesting most starchy, carbohydrate-rich foods, including popcorn, your large intestine produces gas. Although foods affect people's gas symptoms differently, popcorn might increase gassiness in some people. 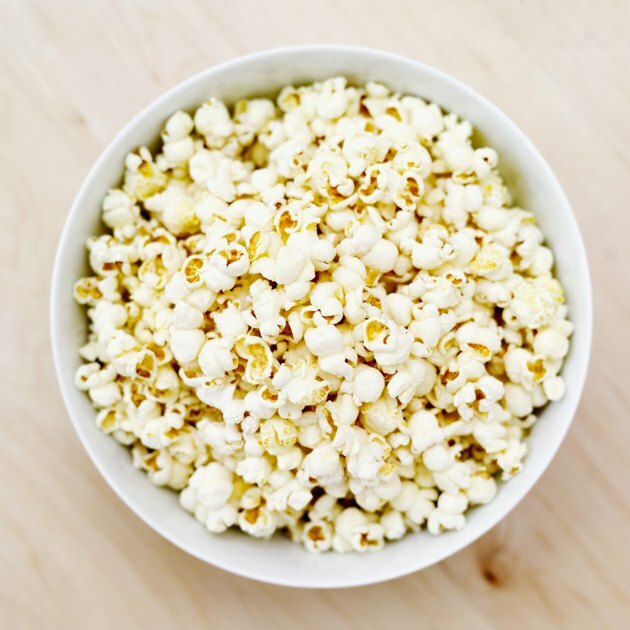 If you eat popcorn quickly, excessive air swallowing also might trigger gas, gas pain and bloating. If fatty popcorn toppings or preparation methods underlie your abdominal pain, consume air-popped popcorn seasoned with natural herbs or low-fat microwave popcorn. If the coarse texture of popcorn causes problems, choose softer whole grain foods, such as soft whole grain breads, whole wheat pasta, oatmeal and brown rice. If your doctor suggests limiting fiber, replace popcorn with low-fiber starches, such as white bread, instant rice and soda crackers. Mild or occasional abdominal pain after eating popcorn might not require medical treatment, particularly if you find that changing your eating habits resolves them. For mild indigestion pain, over-the-counter antacids can help. For more serious conditions, such as digestive diseases, treatment might involve medications, dietary and lifestyle changes and, in severe cases, surgery. To prevent future symptoms, avoid foods that seem to trigger or worsen your symptoms. Because anxiety can worsen abdominal pain in some cases, seeking relaxation and managing emotional stress also might play a role in treatment.